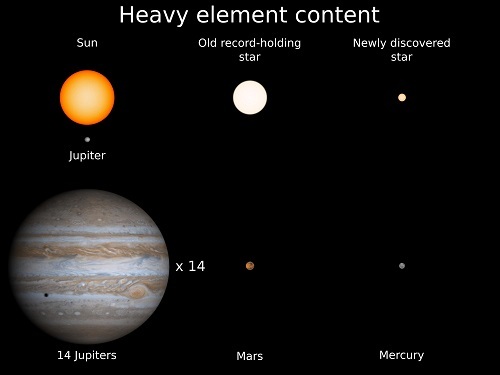 The new discovery is only 14% the size of the Sun and is the new record holder for the star with the smallest complement of heavy elements. It has about the same heavy element proportion as Mercury, the smallest planet in our solar system. Credit: Kevin Schlaufman. Astronomers use the Gemini Observatory to investigate a tiny star that is likely the oldest known star in the disk of our galaxy. The diminutive star could have a disproportionate impact on our understanding of the age and history of our Milky Way Galaxy. It also provides a unique glimpse into the conditions present in the young Universe shortly after the Big Bang. A tiny star found in our galactic neighborhood is presenting astronomers with a compelling glimpse into the history of our galaxy and the early Universe. The star has some very interesting characteristics: it’s small, it’s old, and most significantly it’s made of material very similar to that spewed by the Big Bang. To host a star like this suggests that the disk of our galaxy could be up to three billion years older than previously thought. “Our Sun likely descended from thousands of generations of short-lived massive stars that have lived and died since the Big Bang,” said Kevin Schlaufman of Johns Hopkins University, leader of this study published in the November 5th issue of The Astrophysical Journal. “However, what’s most interesting about this star is that it had perhaps only one ancestor separating it and the beginnings of everything,” Schlaufman adds. The star, which goes by the designation 2MASS J18082002-5104378 B, also challenges the assumption that the first stars in the Universe were large, exclusively high-mass and short-lived stars. In addition, its location within the usually active and crowded disk of our galaxy is unexpected. 2MASS J18082002–5104378 B is a part of a binary star system. It is the smaller companion to a larger low-metallicity star observed in 2014 and 2015 by the European Southern Observatory’s Very Large Telescope UT2. Before the discovery of the tiny star, astronomers mistakenly believed that this binary system might contain a black hole or neutron star. From April 2016 to July 2017, Schlaufman and his team used both the Gemini Multi-Object Spectrograph (GMOS) on the Gemini South telescope in Chile and the Magellan Clay Telescope at Las Campanas Observatory to dissect the star system’s light and measure the object’s relative motions, thus discovering the tiny star by detecting its gravitational tug on its partner. “Gemini was critical to this discovery, as its flexible observing modes enabled weekly check-ins on the system over six months,” Schlaufman confirms. “Understanding the history of our own galaxy is critical for humanity to understand the broader history of the entire Universe,” said Chris Davis of the United State’s National Science Foundation (NSF). NSF funds the Gemini Observatory on behalf of the United States, additional international partners are listed at the end of this release. 2MASS J18082002–5104378 B has only about 14% the mass of our Sun making it a red dwarf star. While average-sized stars like our Sun live for approximately 10 billion years before extinguishing their nuclear fuel, low-mass stars can burn for trillions of years. The discovery of 2MASS J18082002–5104378 B gives astronomers hope for finding more of these old stars which provide a glimpse at the very early Universe. Only about 30 ultra metal poor stars have been identified. “Observations such as these are paving the way to perhaps one day finding that ever elusive first generation star,” concludes Schlaufman. See also the Monash University article here .